I moan and complain about the winter, but there is one big positive that I’m reminded of every time I go into my kitchen. Winter is slow cooker season! I’m using the slow cooker at least five nights a week. I’ve only had a few slow cooker fails. Most meals turn out great! I’ve also been keeping an eye on meat sales at our local grocery store. I’d stock up if I had a freezer, but I usually only buy enough that I know that we will eat in the next week or so. One type of meat we all enjoy is pork tenderloin. I’ve made it with honey garlic sauce as well as fresh herbs (rosemary is tasty) and also with an Asian flair! 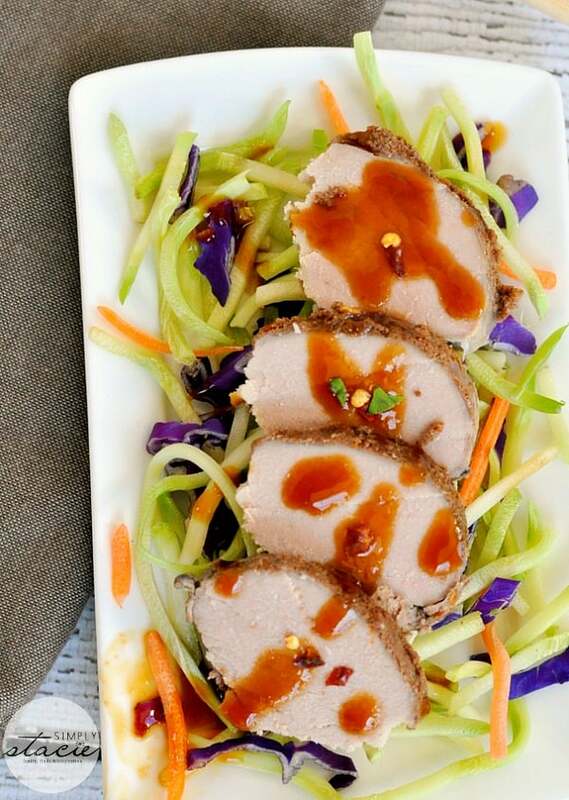 This recipe for Asian Pork Tenderloin has amazing flavour! The pork tenderloin itself cooks for 6 hours in the slow cooker. Get it started around lunch time so it’s ready for supper that evening. Before serving, make the ginger glaze on the stove to serve on top of the pork. Eat it alone or serve it over some rice. Yum! For another pork tenderloin recipe, check out my aunt’s recipe for Honey Glazed Pork Tenderloin. What is your favourite way to cook pork tenderloin? 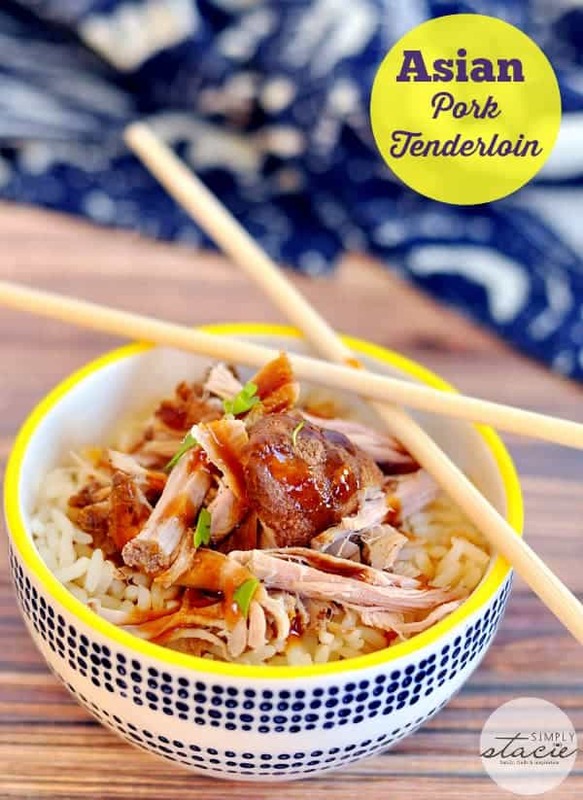 An easy recipe for Asian Pork Tenderloin made in the slow cooker and topped with a ginger glaze! spice). Stir until combined. Rub over pork tenderloin. Add 1⁄2 cup water to bowl of slow cooker. Place pork inside. Cook on low for 6 hours. Once done, either slice or shred. For glaze, combine soy sauce, lime juice, ginger and brown sugar in a small saucepan. Bring to boil over medium heat and whisk until sugar is dissolved. In a small bowl, whisk together cornstarch and 1⁄4 cup water. Add to saucepan and return to boiling, stirring constantly, until mixture is thickened. Serve over pork. Such a flavorful way to cook a tenderloin! Love using the slow cooker, and LOVE a new recipe for pork tenderloin! oh this seems to easy and looks so tasty! Thank you I’ve pinned it for later! 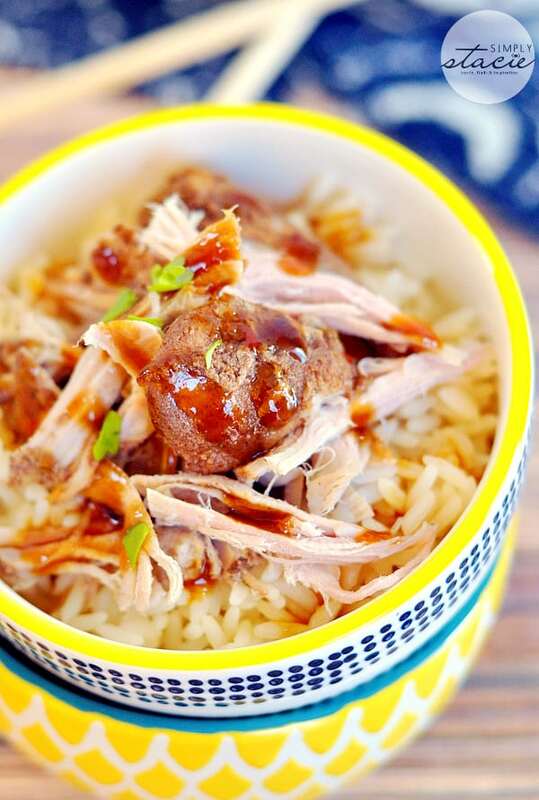 Sounds like a great recipe and so easy since it uses the slow cooker! Thanks for sharing it! My hubby loves a good tenderloin. This one sounds delicious. Nice recipe! Looks lean and tasty! I usually roast pork tenderloin in the oven. I have a slow cooker but haven’t cooked very much with it as yet. This might be the recipe to start. Thank you. It sounds yummy. 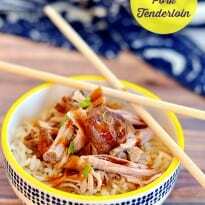 Haven’t had pork tenderloin in a long time, thanks for this post! This looks delicious and I will have to try it out- thanks! This looks delicious, but I don’t eat pork so I’ll have to try it with chicken or turkey. Thank you for sharing this recipe. This seems like another great recipe. This looks so delicious! Thanks for the recipe will have to try it! Looks so delicious!! I would love to try this out!! WOW! This looks so good! I can’t wait to make it. Thank you for sharing. Your recipe looks delicious. I love to buy pork tenderloin when it goes on sale and make great recipes with it. I popped over from Ladybug Blessings link party and thought it was really neat you are a fellow Ontario mom blogger. I live in Southern Ontario (which this winter has felt like Northern Ontario!). This looks simple and delicious! Anything in the slow cooker is always great because its usually less work for me and the house always ends up smelling delicious! Thanks for sharing! I stopped by from Think Tank Thursday! That looks so tasty!! I love using my slow cooker too… it’s so convenient and simple 😀 Thank you for linking up to Friday Favorites 😀 Enjoy your weekend! I always find pork on sale but never know what to do with it. This will be perfect for next time! Pinned! Thanks for the recipe! Looks really tasty! Thanks for linking up at Best of the Weekend! Pork tenderloin is one of our favourites! I m looking forward to trying this delicious sounding recipe. 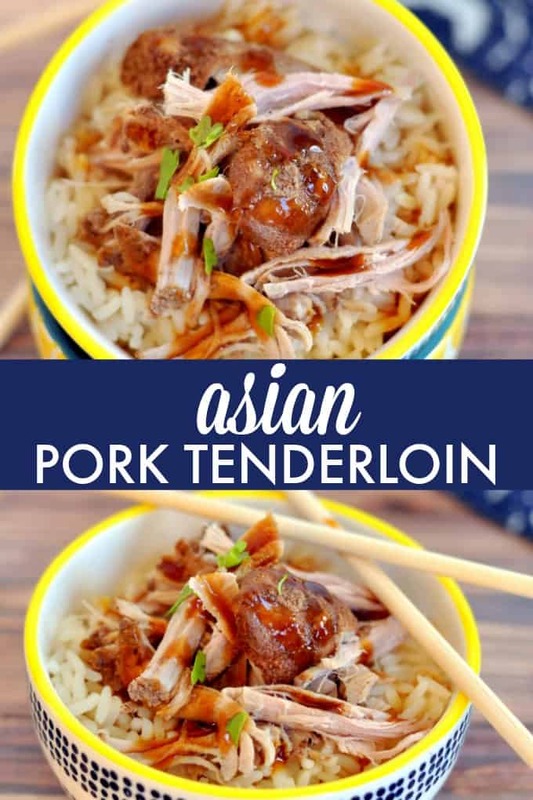 I just pinned your Asian Pork Tenderloin to my Pork Board. Thanks so much for sharing this awesome recipe with Full Plate Thursday. Hope you have a great weekend and come back soon! We are always looking for new ways to prepare pork…thanks! Yummy such a savory way to cook a tenderloin!